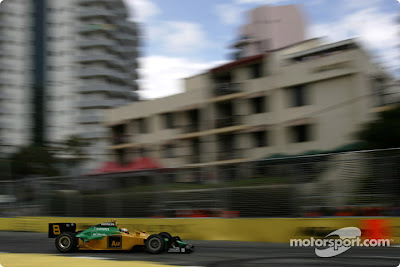 In the final race of the 2008 IndyCar season, with the championship already determined, Surfers Paradise Australia saw a tale of two native sons play out in a way that summed up a most unique season. The 2008 IndyCar Series brought with it the drama of a host of new drivers and teams when back in late February it was announced that the two open wheel racing series that have the majority of their races and management in North America would merge into one competitive series. One racing series (IndyCar) raced primarily on closed circuit, oval shaped, banked venues in the United States, the other (ChampCar) held the vast majority of their races on temporary and closed course street, airport, and road locations - internationally. With the merge, it was hoped that one series that featured a blend of both types of challenges for the drivers and teams would make for a better product … and for the most part, it is. Take the last race of the season as an example of both the competitive aspects and the frustration of a merge when two native sons, Will Power of KV Racing Technology and Ryan Briscoe of Penske Racing squared off for the win at Surfers Paradise along the Gold Coast region in eastern Australia. In the days leading up to the race held last night, North America time (mid-day Sunday in Australia) Will Power dominated the time trials during the warm-up sessions and captured the lead starting position in qualifying – a position he has captured twice before during the previous ChampCar races held at this venue. But while Power has been unbeatable in qualifying at Surfers, his luck on race day has been abysmal, with collisions spoiling his races in every home appearance so far. A lapped 12th place in 2006 was his best Surfers finish to date. "I can't believe I have another pole start here. But, it's only the pole and the goal is to win the race on Sunday. To win, Power would have to run a mistake-free race with New Zealander and 2008 ICS Champion Scott Dixon of Target Chip Ganassi Racing and Australian Ryan Briscoe of Marlborough Penske Racing. 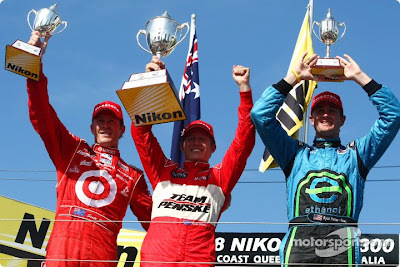 Ryan Briscoe fended off Scott Dixon to take a home win at Surfers Paradise, after Will Power crashed out of the lead having dominated most of the weekend. For the third year in a row, Power's race ended in an accident after he had taken a commanding pole. But unlike his previous Surfers disappointments, this time Power's incident was a solo mistake rather than a collision. The KV driver's crash on lap 16 left Briscoe (Penske) leading from Dixon (Ganassi), where he would remain until the flag. Power immediately opened a four-second advantage at the start, as Dixon had to back off and hand second to Briscoe having cut the first chicane to hold the position on the opening lap. An early yellow for a crash by Dale Coyne Racing's Mario Moraes, who had already tangled with Vitor Meira (Foyt) at the start, brought Briscoe and Dixon back onto Power's tail, but the Australian had little trouble pulling away again at the restart. Although Briscoe began chipping away at his lead, Power was still two seconds in front when he misjudged the Turn 5/6 chicane on lap 16 and smashed his left-front suspension on the wall. "I just clipped the inside wall," said Power. "Just a very bad mistake, very unfortunate. We were saving heaps of fuel, I wasn't pushing hard and it just caught me out." Briscoe and Dixon dominated the second half of the race, with the Penske driver able to hold a steady two-second advantage over the current champion. That gap was reduced to almost nothing with five laps to go, when Briscoe was badly held up lapping Patrick, but the Australian was able to resist huge pressure from Dixon and claim his third win of the year. "What a way to finish the year and kick off 2009," said Briscoe. "It's a dream to win in my home country." Newman/Haas/Lanigan's Justin Wilson, who had been a match for Power in practice, was forced to start at the back following pre-race gearbox problems. He carved through the field early on - making up 11 places in six laps - but would drop right out of contention after a tangle with Bruno Junqueira at a restart. So, how did the Transition Teams and Drivers fare in this final race of the inaugural merged IndyCar open wheel racing series? Motorsports racing champion and Canadian Paul Tracy will be racing in the Craftsman Truck Series when he is set to drive for Germain Racing in the No. 9 Toyota Tundra after successfully testing with the team back in May at Chicagoland Speedway. 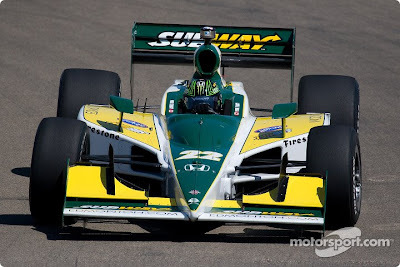 2008 saw many good drivers become shuffled out of competition in the major open wheel racing series as it became unified when ChampCar and IndyCar racing series merged. Many drivers ended up scattered about with some remaining here in North America to race in the American Le Mans Series, while others found rides in Europe in other specialized promotional racing series. Tracy was left on the sidelines, with “one-of” outings at Long Beach for Forsythe and Edmonton for IndyCar Series President and Vision Racing Team owner, Tony George - his only appearances of the 2008 racing season … where he had competitive showings. Paul Tracy will get behind the wheel of his NASCAR Series Toyota Tundra in Texas next week. Former Champ Car champion Paul Tracy is set to return to NASCAR by making his Craftsman Truck Series debut next week at Texas Motor Speedway. Tracy's teammates for the weekend will be title contender and 2006 Truck Series champion Todd Bodine and rookie Justin Marks. "Germain Racing is a championship organization, and I'm excited to be behind the wheel of the Bombardier Learjet/Sport Clips Toyota Tundra in Texas," said Tracy. "Todd and I are good friends, and I'm looking forward to helping him and the Germain Racing team win the race in Texas and gain spots in the point standings. I appreciate them giving me the opportunity, and I will do whatever I can to support their effort at Texas." Tracy made his NASCAR debut in 2006 when he ran six races for two different teams in the Nationwide Series. His best result came in the season opener at Daytona International Speedway, where he finished 24th. At the time, he was looking into making a permanent switch to NASCAR, but ultimately decided to sign a long-term Champ Car deal with Forsythe Racing instead, having struggled to find a competitive Cup seat.